Preheat waffle iron. In a large bowl, whisk together the Bisquick, milk, egg, and vegetable oil. Spoon into a hot, greased waffle iron and cook until waffles are golden brown. In a large saucepan, heat Velveeta cheese and whipping cream together until smooth. Pour over cooked macaroni pasta. 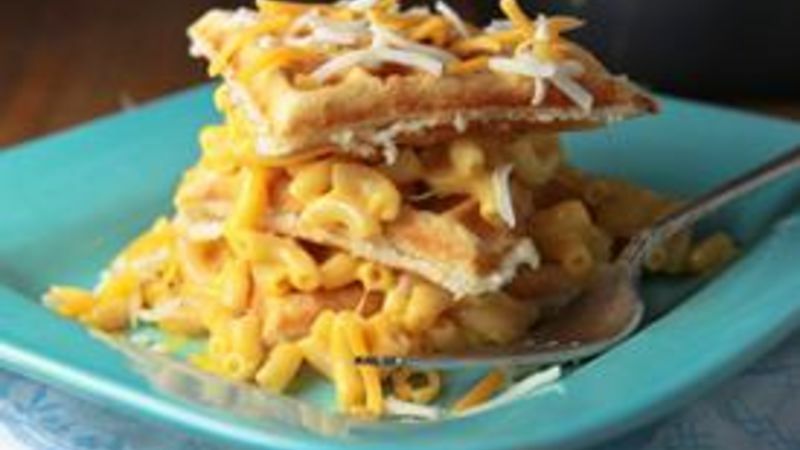 Serve by spooning heaps of mac and cheese between waffles. Top with cheddar cheese, if desired. Is it breakfast, or is it lunch? With mac 'n cheese snuggled up to warm 'n wonderful waffles, you decide! Macaroni and cheese is just that all-time perfect year 'round meal. Quick, easy and always yummy. And, oh, so are waffles. And with autumn just around the creaking corner (and while I'm still not sure who authorized this insanity), I'm preparing my pantry for the impending change in weather by stocking up on pasta and reminding myself that a little bit of comfort food is nearly an equal trade for lazy days at the pool and endless sunshine. Right? Riiiiiight. 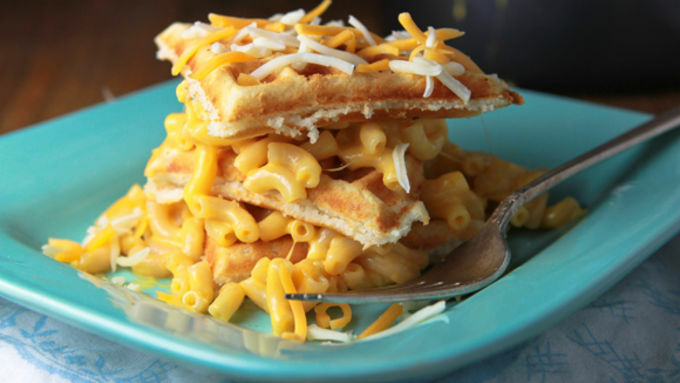 If you're looking for the ultimate way to ease yourself into some serious comfiness, how's about we whip up some Mac and Cheese Waffles? Two of the world's best comfort foods become one. Yeow, baby. Prepare they bellies. It all starts with a box of Bisquick. Of course, just about everything delicious starts with a box of Bisquick. 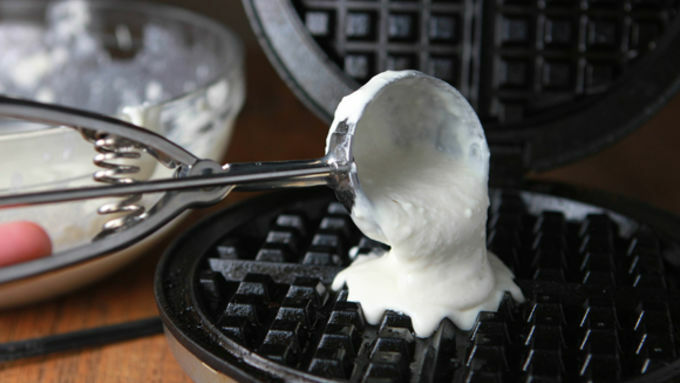 Great tip here: use an ice cream scoop to transfer the perfect amount of batter onto your waffle iron! 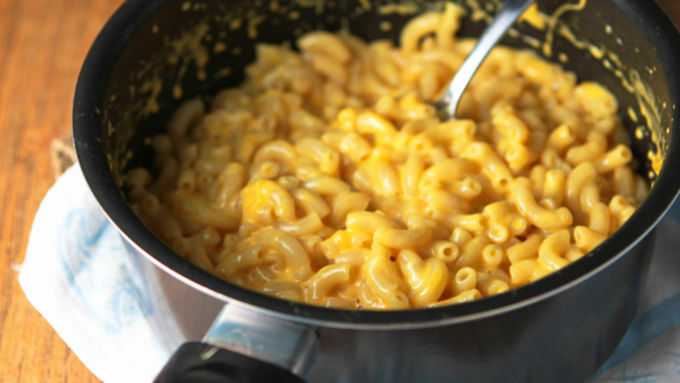 We went supercrazysimple here and gave you the ultimate recipe for creamyliciousness with hardly an ounce of time needed to toss it all together mac and cheese. Keep the waffles whole, or break them into bite-sized pieces. Whatever works for your belly! Put it all together. Waffle, macaroni and cheese, waffle, your face. Time to say, "welcome to my belly, you two!"